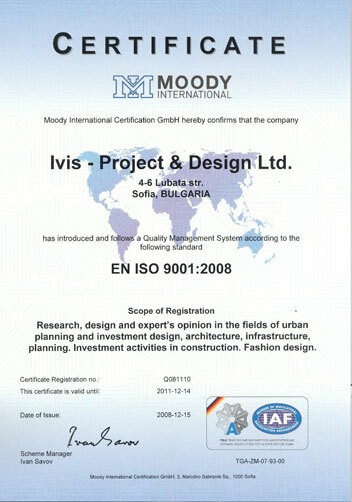 CONTRACTOR: IVIS – Project and Design Ltd. The project is prepared by Architectural Studio IVIS – Project and Design Ltd. with Manager Architect Lekov on the grounds of a request made by the Investor and technological offers submitted by Dopelmayer and Poma. The station of the facility is conformable to the approved Detailed Structure Plan. The terraces are consistent with the slope of the adjoining terrain. 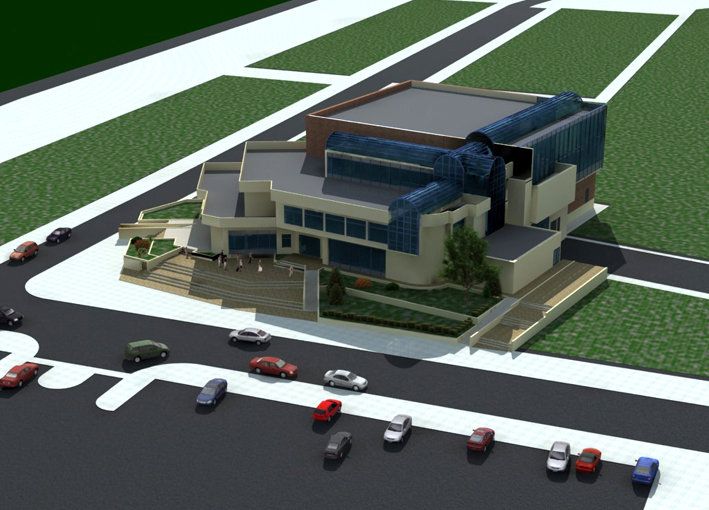 Elevation ± 0.00 = 1055.00 м and is accepted according the offer for the technology of the facility. The station is executed in two main levels between elevation ± 0.00 and roof of the transport hall. 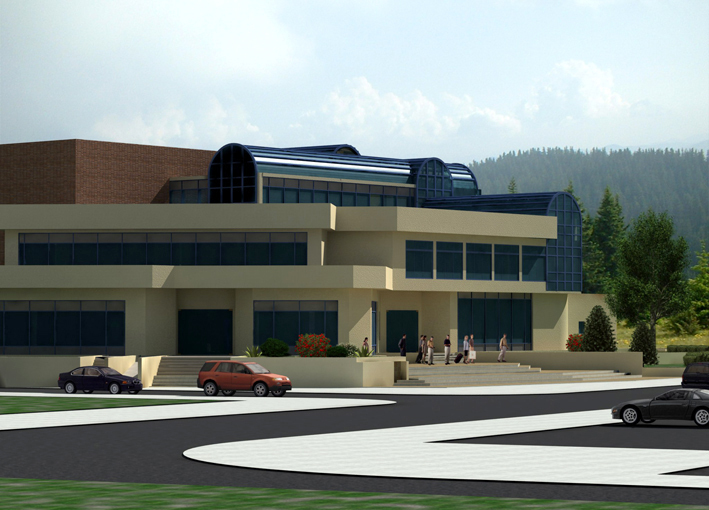 • At elevation – 4.50 are situated: the entrance for the visitors; Ticket Center; Ski School; Ski Wardrobe; Ski Repair Shop; Post Office; Internet; Conference Hall With Press Center; Technical Premises; Medical Center; Office Premises. 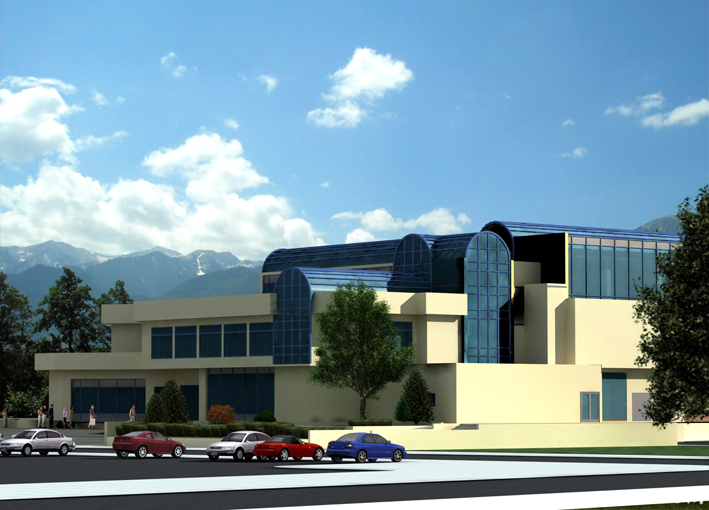 • At elevation ±0.00; -0.35 are situated: Transport Hall; Ski Club; shops; Photo shop; and offices. The mechanics of the lift shall be mounted according the project of Dopelmayer and Poma on the bearing structure from the Bulgarian side. The Transport Hall with parking for cabins is executed in compliance with the technological requirements for axes, apertures, embedded parts, entrances, exits, axes points, construction and light dimensions. The minimum light height to the fitting beams is 690 cm for the Transport Hall and 520 cm for the parking for cabins. The elevation of the floor is consistent with the difference of 30 cm between the level of lifting up and descent and the level of entrance in the cabins in the building of the station. The floor is envisaged to be executed in self-spilling putty. The Control Cabin has one work premises for the operators and one for arranging the necessary apparatus. The main level with the Transport Hall and the Control Cabin are envisaged to be executed in reinforced concrete bearing structure and wooden walls. The wooden parts are made form planed wood, impregnated with varnish cover. The floor of the Ski Club, the Ski Wardrobe and the service premises are executed in special textile cover on rubber base, which prevents slipping, and which is in appropriate colour according the function of the premises. 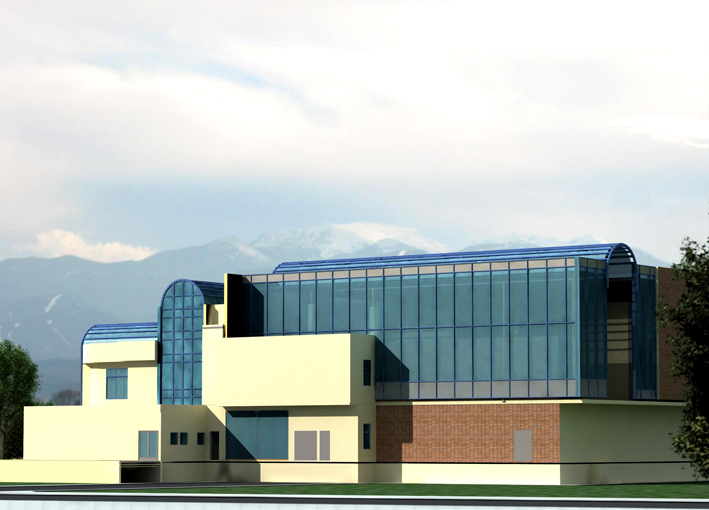 The cover of the facility itself is executed in two layers of polycarbonate 16 mm thick on the bearing metal structure. This cover has high light transmission qualities and is resistant to extreme climate conditions. The upper layer has an infrared protection cover. The internal layer of the polycarbonate cover is light blue. The cover of the parking for the cabins is envisaged to have a flat roof and minimum sloping of the cover from galvanized sheet iron. The cover of the Ski Club, entrance and exit, Cashiers Desk and Ski-Rent Office, together with the premises for the operators and apparatus also shall be executed with a flat roof with minimum inclination. Under the roof structure of the entrance, Ski Club, Ski-Rent Office and Cashiers Desk is envisaged a suspended heat insulated ceiling. The surrounding area is modeled in such a manner as to provide access to all premises according the design: terraces, platforms, and stairs. • Wooden roof structure, providing the necessary inclination. • At elevation - 0.30 - self-spilling putty. The metal rails for the assembly of the equipment shall be mounted on the bearing structure elements of the building according the details of the suppliers of the equipment and the joining drawings of the metal structure executed by the Bulgarian side. The walls of the Transport Hall are envisaged to be executed in suspended glass façade. The walls of the rest of the premises are envisaged to be executed in aerated concrete blocks and processed on the inside in compliance with the function of the premises – wooden panel work, gypsum hardboard or faience, and from the outside with mineral relief plaster. The suspended ceilings are envisaged to be of type Knauf, covered with latex. The metal elements are envisaged to be cold zinc plating. The windows joinery is envisaged to be from PVC with glass package and suspended for the Transport Hall. The doors are from PVC with glass package. The entrance doors are envisaged to be with photocells. The details for the execution shall be specified in phases TP and WP.